Articulate Storyline has an option to publish for local playback. Use this option if you need to deploy your course on a CD, DVD, or standalone computer (kiosk). When the Publish window appears, select CD on the left. The ellipsis button (...) beside the Title field lets you open an additional window where you can enter optional project information. This information will only be used if you later publish for the web and learners view the course on an iPad or Android tablet with the Articulate Mobile Player app. For details, see this tutorial. Use the Description field to give learners a synopsis of your course. Currently, the course description only appears on information cards in the Articulate Mobile Player app, so it doesn't apply to CD-published content. Use the Folder field to indicate where you want to publish your course (for example, your computer desktop). Click the ellipsis button (...) to browse to a specific location. Storyline will create a new folder in that spot with all the files needed to operate your course. Important: Always publish to your local hard drive. Publishing to a network drive or a USB drive can cause problems with your published output. After publishing to your local hard drive, burn the output to a CD or DVD, copy it to a USB drive, or upload it to a shared network drive. 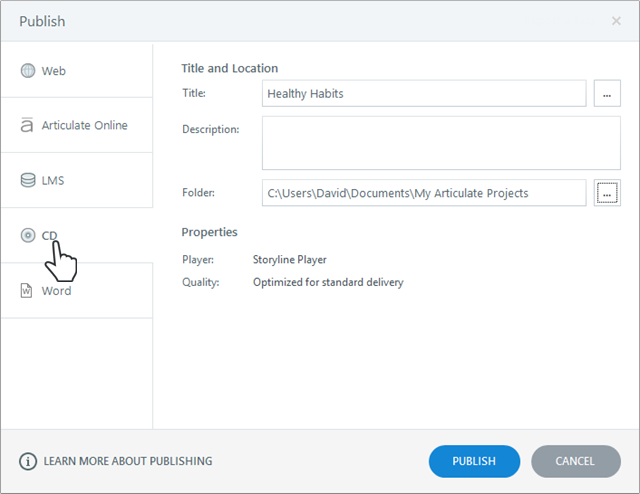 The Properties section of the Publish window lets you make last-minute changes to your course player and the compression settings Storyline uses when publishing. The Player field shows the name of the player currently assigned to the project. (The player is the interface that learners see around the perimeter of your slide content.) Click the player name if you'd like to make adjustments or switch to a different player. If you need help choosing your player settings, see this tutorial. The Quality field lets you control the compression settings Storyline uses for audio, video, and pictures in your course. The quality settings default to whatever you used the last time you published a course. To change them, click the blue text, make your adjustments, then click OK. 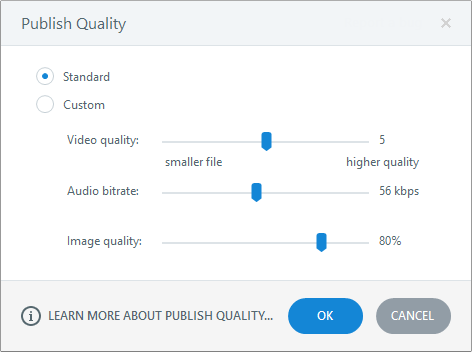 Choose Standard if you want to use the default settings: video quality of 5, audio bitrate of 48kbps, and image quality of 80%. Choose Custom if you want to define your own quality settings, then drag the slider for any of the three values to change the compression. Using higher values gives you higher-quality output but also results in larger file sizes (which means longer download times). Lower values give you smaller file sizes and faster download times, but the visual and audio quality will be lower as well. When you're finished making selections, click the Publish button. 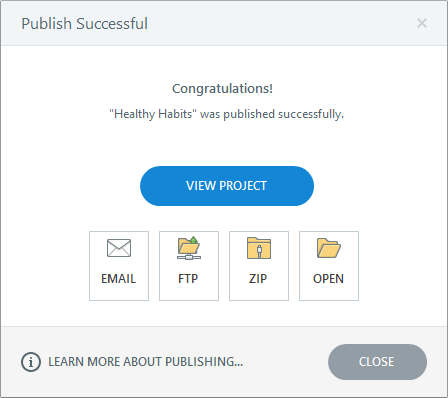 When the publishing process is complete, you'll see the Publish Successful dialog. View Project: This launches your course so you can view it. Email: This opens up a new email message with a zipped file of your published output attached. This makes it easy to share with a subject matter expert (SME) or someone who will place it in the location from which it'll be deployed. FTP: This opens a window where you can enter your FTP credentials and transfer your output to a server. This probably isn't something you'd need to do, since you've chosen to publish for CD. Zip: This creates a zipped file of your output in the location you specified on the Publish window. Open: This opens a file viewer where you can see the files Storyline just created. There will be several folders and files. The file that launches your course is called Launch_Story.exe. There’s also an autorun file, which causes your course to launch automatically if you burn it to a CD. After publishing, you can burn the output to a CD or DVD, copy it to a USB drive, or upload it to a shared network drive. If you burn your course to a DVD, it must be played in a computer DVD drive. It won't function in a DVD player on a TV. If you use a USB drive or network drive to deploy your course, learners should copy the files to their local hard drive, then double-click the Launch_Story.exe file to play the course.